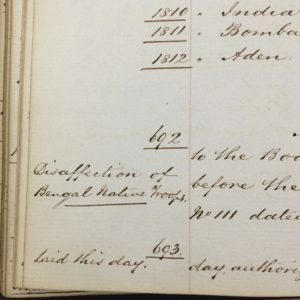 In our last blog, we looked at some of the ways in which the events of 1857 played out in one nodal point of the network of empire: how colonial administrators, as they went about the business of moving goods, people and capital around that network, coped with new stresses and anxieties, assessed risk, and strategized against potential anti-colonial resistance. In the management of education and language policy in Mauritius, we saw how these process were linked with the regimes of knowledge, acculturation and pedagogy through which imperial power was reproduced. 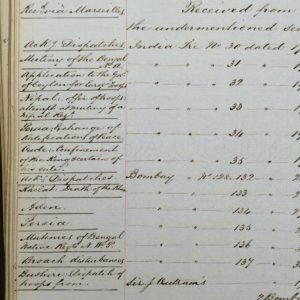 Over the past couple fo months, as we’ve been going through the 1857 materials in the records of the East India Company and the Colonial Office, we’ve begun to get a clearer picture of the year’s events as an interlinked series of upheavals whose ramifications reached through every part of the global network of imperial governance. The most consequential event of the year, of course, was the Indian Uprising. But at the same time but there was also a serious conflict in Persia, the beginning of the Second Opium War in China, and the aftermath of the unrest, famine and millenarianism of the Great Xhosa Cattle Killing in the Cape. The reverberations of the Crimean War and the ongoing continental anxiety over what would become known as the Eastern Question were still conditioning the mood around the Black Sea, the Middle East and Central Asia. Meanwhile, as these matters were aligning global affairs into ever-more-intricate interrelationships, the means by which people and information travelled were in constant development. Telegraphs were being laid in India and across Europe, and the first transcontinental link had just crossed the Atlantic; the railway boom of the 1830s and 40s in Europe had been extended to India, with a flurry of projects beginning to take shape and lines already being built; and steamship technology continued to increase in speed and efficiency, while the infrastructures which supported it – coaling stations, navigation aids, engineering base, deepwater ports – grew apace. 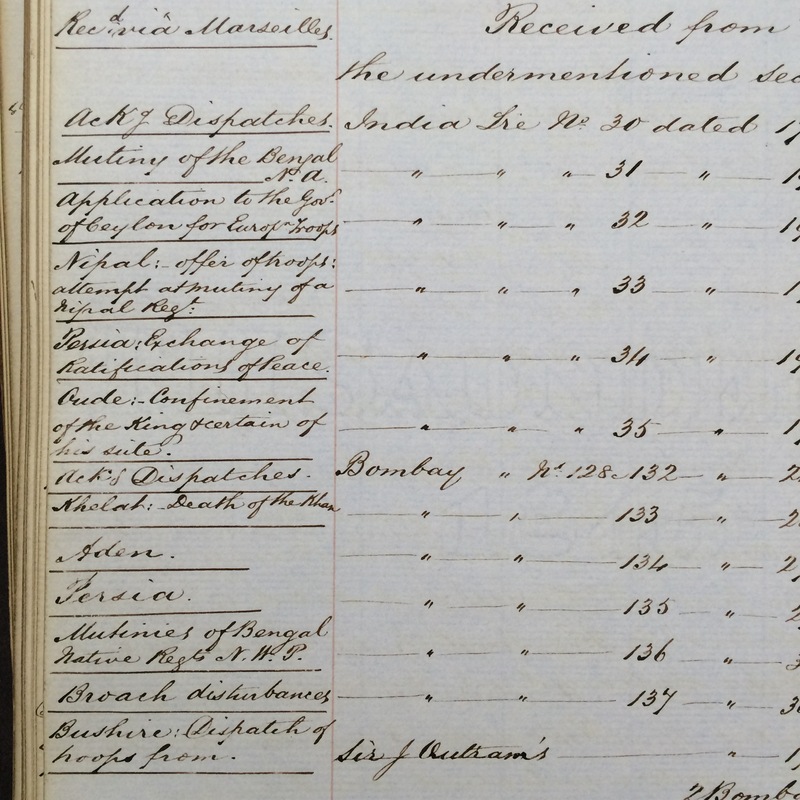 For the past few weeks, I’ve been focusing on the records of the Political and Secret Committee of the East India Company. This committee dealt, as its name implied, with matters which could not necessarily be broadcast publicly: matters of diplomacy, warfare, geostrategy, political negotiations and future policy. The Uprising, and the wider crisis of 1857, throw into sharp relief the means by which the empire was governed; the archive of the Political and Secret Committee (hereinafter P&S) provides some potent insights into the inner workings of that system of governance, and the contradictions and tensions in its modes of crisis response, policy-making, and the organisation of geostrategic action at a distance. Here, a bundle of dispatches has been received through Marseilles. Besides the mutinies of Indian and Nepalese regiments, there are reports of disturbances in Broach (Bharuch, Gujarat), reports of the imprisonment of the Nawab of Awadh, and the death of another prince. In Persia, peace terms are being ratified after the Anglo-Persian War, fought to establish the city of Herat under de facto British control (and, in the Persian case, to get it back); a separate dispatch from Sir James Outram, leader of the expeditionary force and still in the Gulf, confirms the dispatch of troops from Bushehr. The Governor of Ceylon, likewise, has been asked to contribute regiments for putting down the mutiny. In the most immediate sense, the Uprising didn’t elicit a particularly subtle response. Whatever the logistical and diplomatic complexities of what followed, the general aim remained obvious and brutally simple: to concentrate the empire’s maximum capacity for violence on suppressing anti-colonial resistance and preventing its spread. For that, the main challenge was that of getting as many troops as possible to Northern India, as fast as it could be done. But how that policy, and others, got made illuminates the extent to which power was networked just as much in the imperial centre as in the global web of empire. The often complex systems of bureaucratic routine, precedence, protocol, subordination, negotiation and duplication through which policy was formed are on full and rich display in the P&S Committee’s correspondence with other government departments, collected in the India Office Records as the ‘P&S Home Correspondence’ (IOR L/PS/3; the volumes for 1857 are L/PS/3/54-56). The first item in this series, as far as the Uprising is concerned, is a request to the Board of Control that the P&S Committee be allowed to share the first telegram (the same one noted in the Fig. 1) with the Court of Directors. The Board, by this point, was exercising control not just over policy but over the internal informational security of the company itself. The nature of Crown Government capture of Company policy by 1857 – how complete it was, what the significant moments of extension were – is a matter of some debate, but it’s worth noting here that the Government had very handily extended a kind of sovereignty over information. 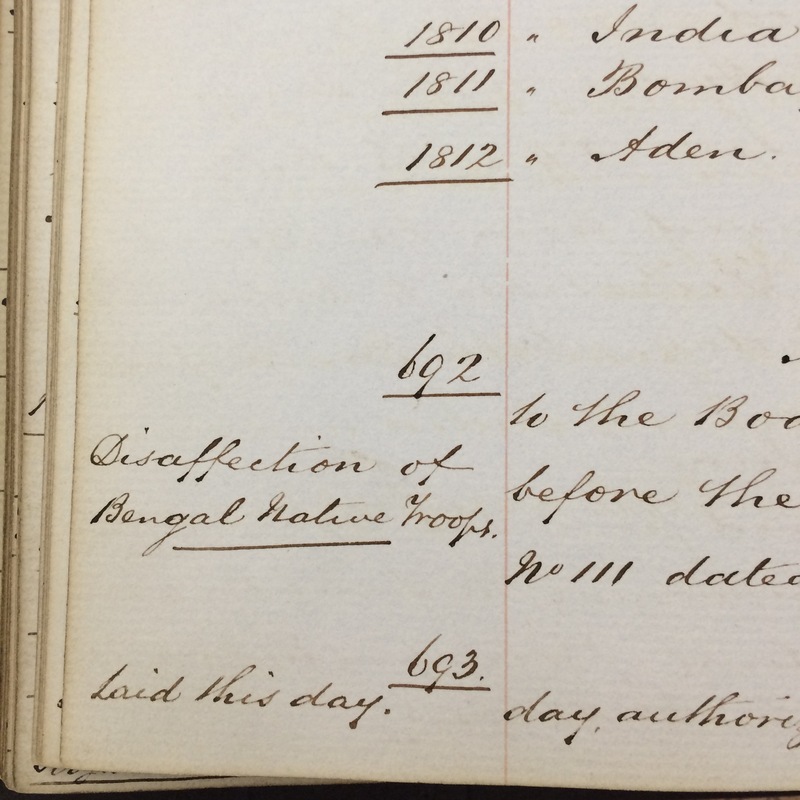 Messages that passed between Company servants in India and those in London belonged, in a sense, to the Government, and the Company only enjoyed access to them on the Government’s sufferance. 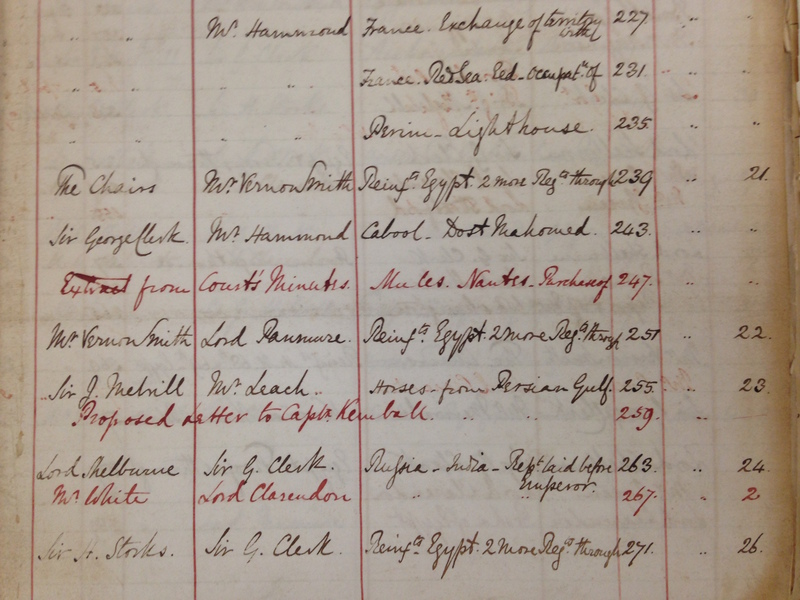 Throughout the Uprising, the communicational networks of the Company ran at full tilt: the collections in the India Office Records series of “Mutiny Enclosures” (largely assembled for fortnightly dispatches by the Suez mail steamer by the unfailing efforts of Henry Lacon Anderson, the chief secretary to the Presidency of Bombay) contain a wealth of military reports, returns, judicial papers, maps, intelligence digests and narratives. In every case, however, only the Board and the P&S Committee had automatic right of access to this material, and applications to share any information with the Court of Directors were frequently refused – as was the case, for example, for the dispatches from Bombay listed in Fig. 2. The Home Correspondence also points up the extent to which the Board was the effective channel of communication with the Company and all other government offices. At first glance, the series looks like a record of communication in all directions between the Committee, the Court and Chairs of the Company, the Board, the Foreign Office, the Colonial Office, the War Office and the Admiralty. Fig 3. Index page to Political & Secret Home Correspondence, September 1857. IOR L/PS/3/56, f.5r. 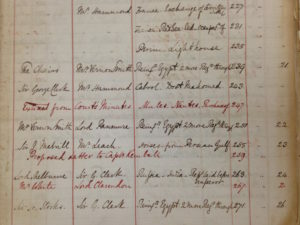 Featuring letters between Sir George Clerk and Robert Vernon-Smith MP (Board of Control) and Sir James Cosmo Melvill (Secretary to the East India Company) and the Company’s Chairs, Edmund Hammond and Lord Shelburne (Foreign Office), Lord Panmure and Henry Knight Storks at the War Office, and W.A. White, HM Consul in Warsaw. For the most part, however, what it actually represents is the correspondence between the Board and all these agencies, with no communication between them except through the Board; except through the Board, the Committee, and indeed the Court and Chairs of the Company, can’t meaningfully communicate with anyone. Not only that: except for the correspondence between the Committee and the Board, everything else here is a copy of an original which the Board holds: the Company itself is reduced to a largely spectatorial role, as if cc’d into an email thread in which they are powerless to intervene directly. The impression the series as a whole gives to the modern historian is of something like a ringside view of policymaking, curated for the benefit of a body whose control of policy was so mediated, policed and deliberately attenuated as to be reduced largely to an advisory function, even while its most vital interests are at stake. Much of the most interesting correspondence is between the Board and the Foreign Office. For instance: the Court wished, with the Board’s concurrence, to send advance parties of officers and men from cavalry regiments through Suez, so that they could arrive in India before the bulk of their regiments – which were travelling via the Cape – and have their establishment prepared for immediate action when they arrived in India. Soldiers in uniform, even those of friendly powers, were not allowed across Egypt, so the soldiers had to travel in ‘mufti’. This necessitated letters under flying seal to both Company agents and consular staff in Suez and Alexandria, letters to shipping companies warning them of the plans, and a flurry of correspondence with Viscount Stratford de Redcliffe, the experienced diplomat serving as ambassador to the Porte, and Major John Green, the (apparently very capable) Acting Vice Consul in Alexandria, relaying the progress of a complex and delicate diplomatic dance between the Ottoman court, the Egyptian Pasha, and the somewhat precarious British presence. Meanwhile, consuls in Baghdad and Aleppo were being briefed to give all possible assistance to Company and Army agents trying to source horses for Indian service, bypassing the Parsi horsetrading families of Western India. The scramble to formulate policy and keep a hold on the global situation means that, among many other concerns, we find Foreign Office staff digging up consular reports from the end of the Crimean War assessing whether it would be possible to recruit the Kurds as irregular cavalry against Persian and Russian opportunism; meanwhile, the Consul in Aleppo sends a series of letters advising that an Arab militia could easily be raised. The Foreign Office forwards letters and carefully filleted digests of intelligence from St Petersburg, including reports of quite abstruse conversations in which hidden meanings might have been intended, and translations of needlingly ambivalent commentary from the Northern Bee (Severnaya Pchela), the semi-official newspaper that was commonly known to be a mouthpiece for the Third Section, the Tsarist secret police. From the Embassy in Washington, there’s a report of an Irish Republican meeting in New York, in solidarity with the rebels – at which it was debated whether Republican activist (and escapee from Van Diemen’s Land) John Mitchel would give his support, since as a fervent anti-abolitionist it was supposed he could not support a non-white insurrection against a white proprietory class; enclosed with the clipping is Mitchel’s almost offensively evasive letter to the editor in reply. Outside of the Foreign Office correspondence, there is a huge volume of correspondence with the War Office, Admiralty and Colonial Office about the movement of troops around the world, in a complex shuffle revealing the insecurities of governors around the empire. There is a long and ongoing correspondence with the Admiralty about navigational infrastructure, particularly that relating to the Red Sea, a sea route whose importance the febrile communicational activity of the Uprising is throwing into stark relief; there is correspondence with Richard Burton, the Arabist and translator of Omar Khayyām, about whether to establish British bases in the Horn of Africa; and a fraught exchange with a Liverpudlian guano prospecting firm over a ban on using Arab labourers on the Khuriya Muriya Islands near Aden. So what’s to be learned from this? Well, as ever in our blog, conclusions are provisional. We’re gathering what we hope will be the materials of a new history of imperial governance; this blog is about the journey rather than the destination. But what we’ve found so far from the records of 1857 is, we think, further evidence of the simultaneity of imperial governance, across multiple modalities of rule, constitutional arrangements, and administrative agencies; of its global reach, its interrelatedness, and of officials’ keen awareness of that interrelatedness; and of some of its contradictions as it changed over time, was contested and pulled in different directions. What we get from the Political and Secret Home Correspondence is an idiosyncratic, and in some ways unexpectedly illuminating, view of a major imperial crisis as it both drew on a global system of power and helped to induce the conditions by which it would be further entrenched.